Help your pup keep up with Realtree High Performance Dog Food. This unique formula designed for the active canine and contains a 30/25 protein-to-fat ratio for one of the highest metabolized energy ratio to be offered in the sport dog food category. Not only is it high in energy but it’s also a low-glycemic formula, too! This helps improve performance and stamina for your dog’s busy day ahead. And your dog will love the taste of this highly-digestible recipe. 30/25 protein-to-fat formula helps high-energy dogs maintain a healthy weight. Crafted with recognizable ingredients like chicken meal, fish meal and dried whole egg. Nutritionally dense recipe is designed to help your dog get more from eating less. Helps encourage healthy skin and a shiny, lustrous coat. Formulated to help enhance your dog’s sense of smell, which is especially key for hunting dogs. Chicken Meal (Natural Source Of Glucosamine), Chicken Fat (Preserved With Mixed Tocopherols- Source Of Vitamin E), Fish Meal (Herring And Anchovy -Natural Source Of Glucosamine), Ground Whole Grain Corn, Whole Brown Rice, Ground Whole Grain Wheat, Dry Whole Egg, Chicken Liver, Dried Beet Pulp ( Sugar Removed), Dried Brewers Yeast, Fish Oil (Herring Oil - Preserved With Mixed Tocopherols, (Source Of Vitamin E), Kelp Meal, Malted Barley Flour, Salt, Potassium Chloride, Calcium Propionate, Flax Meal, Taurine, Ferrous Sulfate, Zinc Sulfate, L-Ascorbyl-2-Polyphosphate (Source Of Vitamin C Activity), Zinc Methionine, Yucca Schidigera Extract, L-Lysine Hydrochloride, Niacin Supplement, Calcium Pantothenate, Copper Proteinate, Manganese Proteinate, Riboflavin (B2), Vitamin A Supplement,Calcium Iodate, Vitamin D-3 Supplement, Thiamine Mononitrate (B1), Pyridoxine Hydrochloride (B6), Cobalt Sulfate, Folic Acid, Beta-Carotene, L-Carnitine, Selenium Yeast, Biotin Supplement, Vitamin B-12 Supplement, Vitamin E Supplement. The best food for highly active dogs!! As an owner of border collies, I'm happy to have found a food that can help my high energy dogs get the fuel they need AND maintain weight! My dogs have never been big eaters and this is the only food I've found where I am confident they are getting all the nutrients they need while feeding less- plus, we get lots of comments on how healthy our coats look. 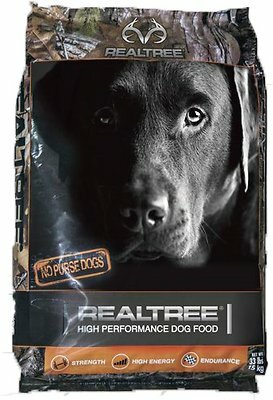 I'm a longterm customer of Realtree High Performance Dog Food and I'm so happy to see I can now get it on Chewy!